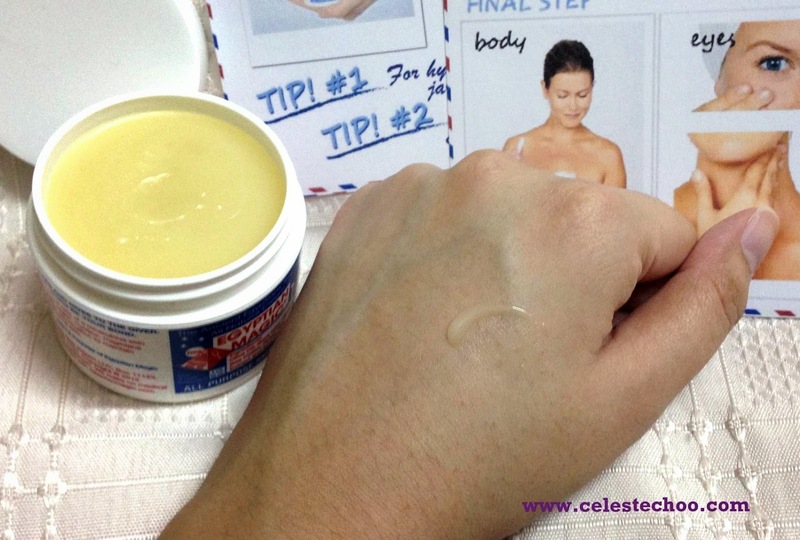 CelesteChoo.com: Egyptian Magic Cream – Why do celebrities and models love this? 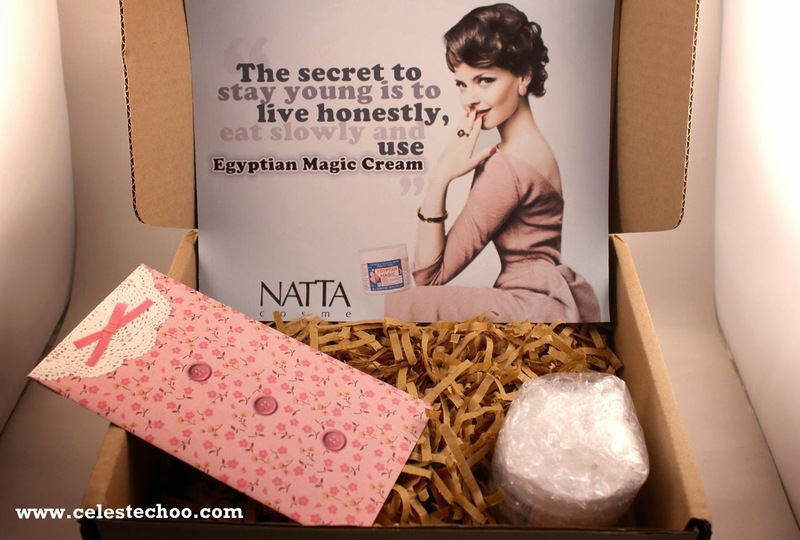 Egyptian Magic Cream – Why do celebrities and models love this? 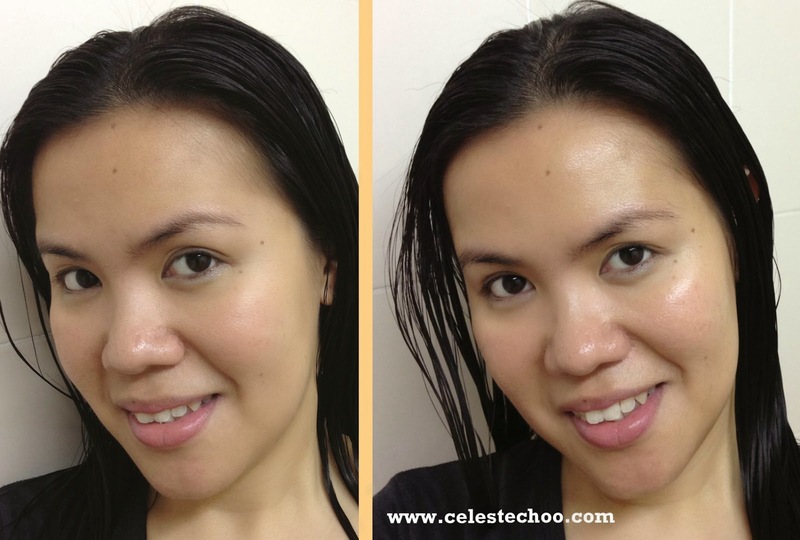 Is it really possible for 1 cream to solve concerns on the body, face, lips, eyes and hair? I’ve heard of all-purpose cream for making salads and desert, or all-purpose flour for pancakes but an all-purpose skin cream? Hmmm, this is new to me. My first question was, why “Egyptian”? I checked the jar, it is not made in Egypt; it’s actually made in the USA. 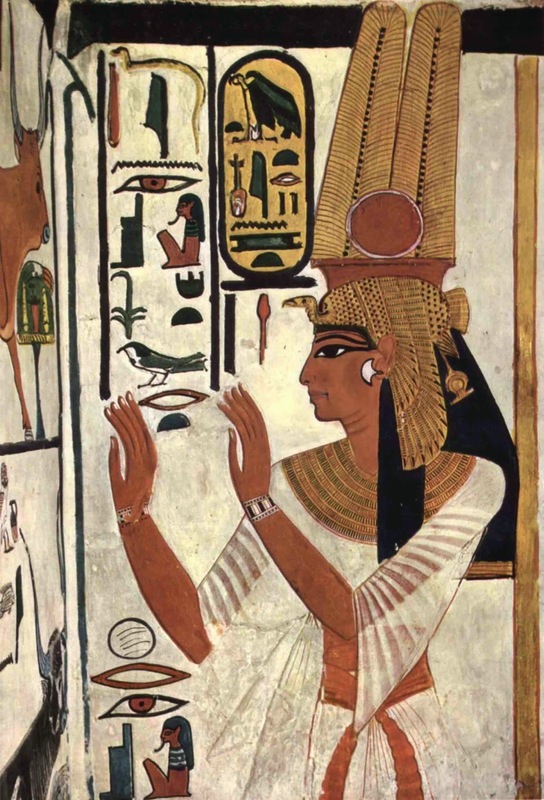 The answer lies in the rich, influential history of the Egyptians when it comes to body care and skin care. The Egyptians are probably the most abundant in ancient practices for beauty and cosmetics. As early as the time of the pyramids or even before that, the ancient Egyptians used soaps that contain olive oil for their cleansing rituals. They also used honey to moisturize their skin and protect it from the arid climate. The scorching heat of the sun and windswept sands caused a lot of skin problems and infections for them so the Egyptians put very high importance to skincare regimen. And men even rubbed oils on their hair to fight baldness and promote hair growth! There is no doubt that the rituals of ancient Egyptians still apply as reliable science for skincare today. The use of certain oils and honey are very beneficial to the skin and even hair. Isn’t it amazing how the ancient tradition still is a relevant practice at this age and time? 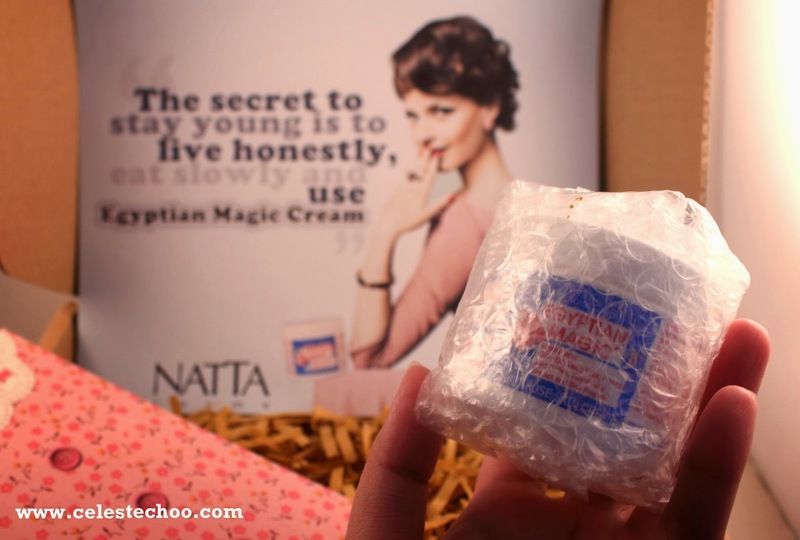 And so I opened my Natta Cosme box containing a carefully-bubble-wrapped Egyptian Magic Cream. The box itself is filled with paper shredding to absorb impact and protect the product from shock. It also contained tip cards indicating how to use the cream and more information. I excitedly unwrapped and unsealed my new Egyptian Magic Cream, looking forward to know what the celebrities are raving about. The cream itself reminds me of petroleum jelly, but the Magic Cream is more solid and not very sticky like the former. The color is of light yellow wax, without fragrance or scent. It just smells of clean, fresh oil. Just to show you how the product looks like (I didn’t rub on my palm), I scooped a small amount onto the back of my hand here. At first, the product itself seems very solid but once it gets in contact with the heat of your fingers, it will melt naturally. Upon rubbing it onto the skin, here you can see that my hand has a film of moisture. 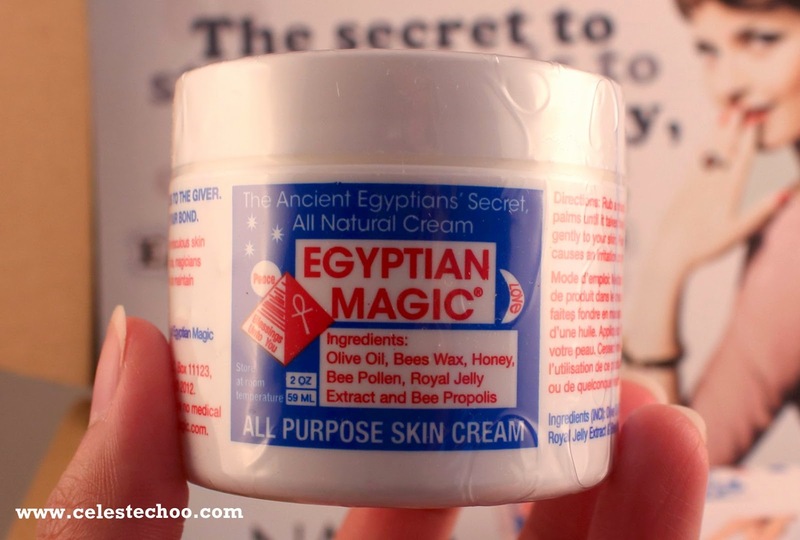 The Egyptian Magic Cream is a great solution to those with dry, chapped hands. I’m the type of person who constantly needs hand cream, especially after washing my hands or the dishes or any activity that involves getting my hands wet. My hands easily get dry but applying this magic cream on my hands at night before going to sleep does magic! Of course I gotta try it on my legs, too! Since it claims that it can be used on the body, I have to test it. I also tend to have dry skin on my legs and it can get very itchy and uncomfortable. But applying EMC on my legs calms down the discomfort and moisturizes my skin well. If you apply it during the day in this tropical weather, it might feel a bit oily so I use it at night before I sleep. We use air conditioner in our room so I really need to apply body lotion to bed. And the Egyptian Magic Cream does a great job in keeping my legs (and arms) hydrated through the night. 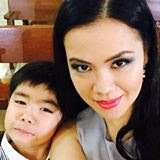 I also apply it on my son’s feet before he sleeps and it makes his feet even more kissable! You can try applying it on your face, too. The Egyptian Magic Cream provides an instant hydration and gives the skin a healthy glow. Here I applied it on my face right after washing. No toner, no serums, no moisturizer. 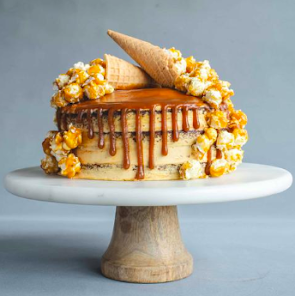 Just the magic cream. 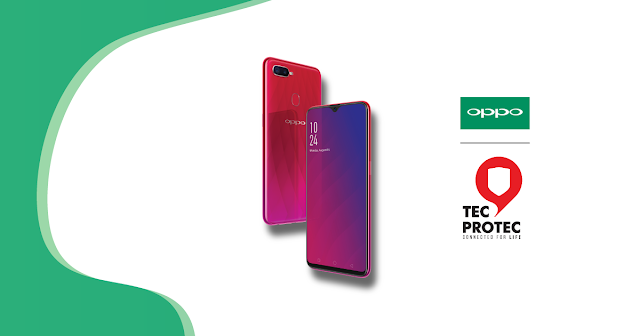 Make sure you just apply a thin film. 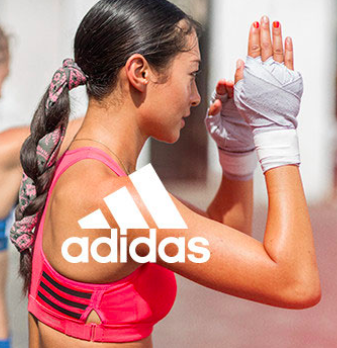 It contains all-natural healing ingredients. 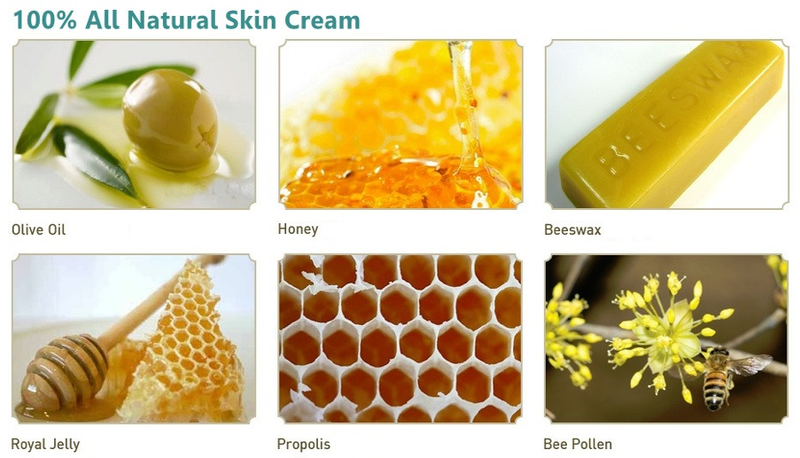 Olive oil + honey + royal jelly + beeswax + bee pollen + propolis in 1 balm. It’s a great moisturizer, making it a powerful anti-aging balm that works on several areas of the body and face. It can be used on children, too! It’s a travel companion. Since you can use it on almost everywhere on the body and you can use it on your kids, it’s simply convenient to bring the Egyptian Magic Cream with you. If you love to go swimming, it’s a great after-sun lotion to soothe the skin and sunburns. It simply works it magic. You’ll wake up to hydrated skin in the morning. It gives dry hair an instant shine. If you plan to use on different parts of the body, you might want to separate the balm into few containers, probably a small jar for eye area, a mini jar for the lips, a jar for face, a jar for hair use, and a jar for body. For optimized results, dab appropriate amount on the area and follow with gentle massage to allow the balm to be absorbed faster into your skin. So who are some of the celebrities who swear by the benefits of the Egyptian Magic Cream? Where to get this multi-purpose magic cream? 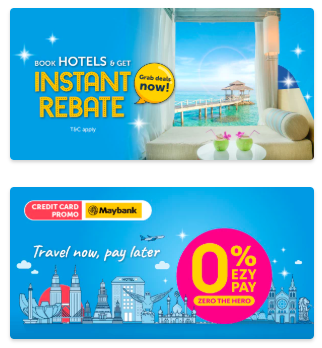 Money-back guarantee within 14 days! 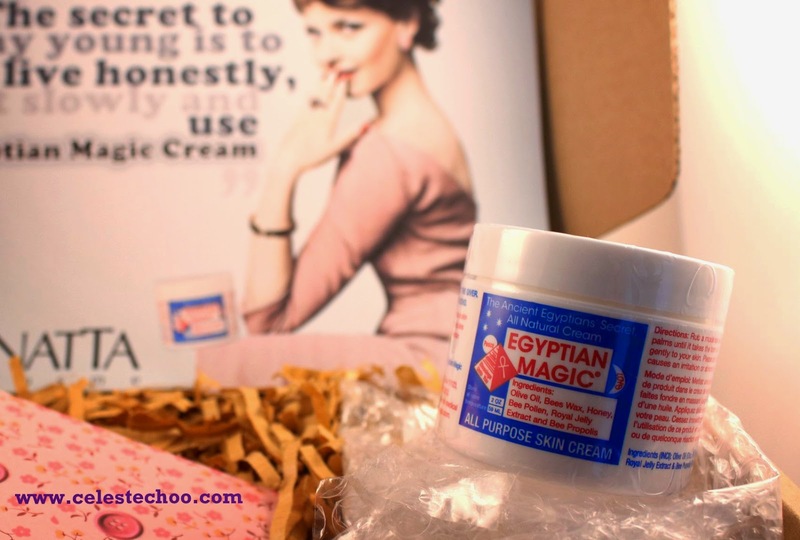 When you order your EMC (Egyptian Magic Cream), it will arrive with a FREE 3ml sachet for you to try first. 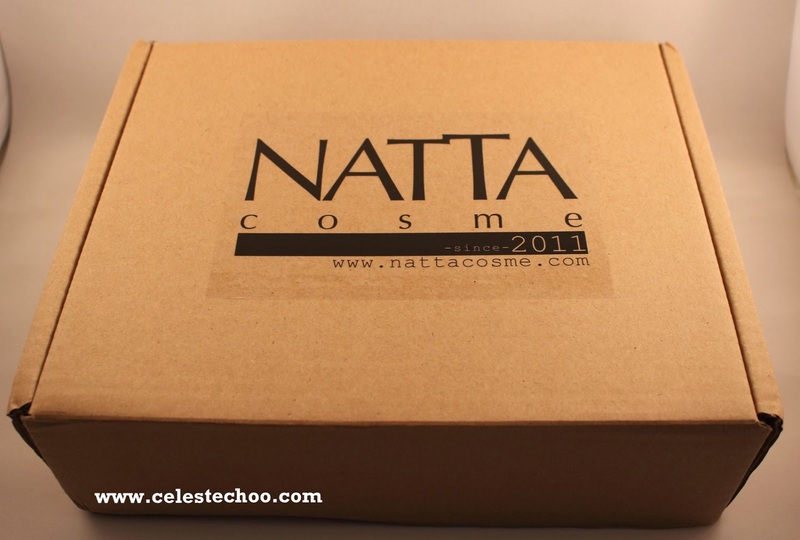 If you’re not happy, just send back the unopened jar and Natta Cosme will refund your money (excluding postage fees). Egyptian Magic All-Purpose Skin Cream "The People's Choice" is made with the following pure ingredients: olive oil, bees wax, honey, bee pollen, royal jelly, bee propolis and Divine love. Gynecologists, plastic surgeons, homeopathic physicians, chiropractors from all over the world sell Egyptian Magic All-Purpose Skin Cream "The People's Choice."